The majestic Osman Sagar at Gandipet sets the perfect backdrop for Hyderabad’s only 5-star resort property – The Golkonda Resorts & Spa. 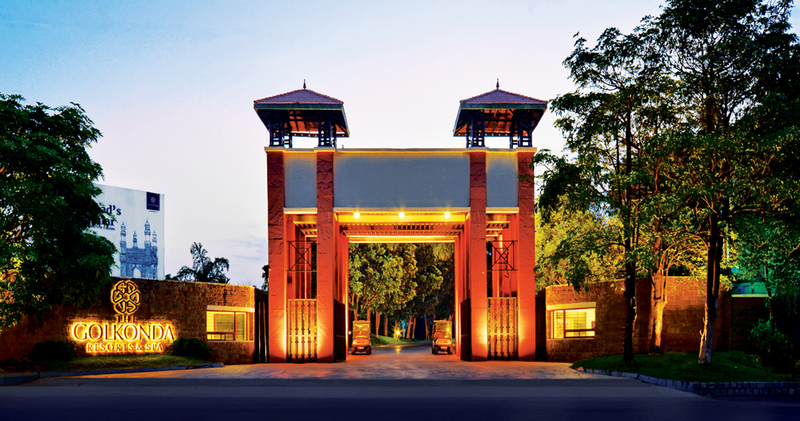 Amidst picturesque landscapes and lush greenery, lies the 13 acre abode of tranquility. Leave the world behind, and embrace the good life as our dedicated team painstakingly curates a luxurious experience tailored to your needs. What sets The Golkonda Resorts & Spa apart is its proximity to the city. In just a few minutes, you are transported from the hustle and bustle to pure serenity. The Golkonda Resorts & Spa boasts of four delectable award-winning dining venues offering your palate the chance to indulge in global cuisines. The 44 luxury villas & 24 premium rooms at the property offer you a varied stay experience on every visit. Merging comfort and luxury in a natural setting, our villas are designed to offer you a blissful night’s sleep. No resort experience is complete without a rejuvenating visit to the spa. The Ixora at Golkonda Resorts offers traditional Thai treatments by experienced professionals who are committed to helping you melt the stress away and giving your body, mind and spirit the pampering it deserves. The Golkonda Resorts & Spa is so much more than just a getaway destination. It’s a space where you can enjoy quality time with the family. It’s a space where nature and luxury blend seamlessly to create an unforgettable experience. It’s a space where you enjoy the finer things in life, and create memories that you’ll cherish for a lifetime. The Golkonda Hotels & Resorts is a renowned name in the hospitality space. With an eye for detail and a dedication towards customer service, we have delighted our patrons with the Golkonda experience.